Differentiate with personalized content throughout the candidate journey. Increase recruiter efficiency and quality-of-hire with candidate fit and activity ratings. AI-driven search provides personalized recommendations and more relevant results. Engage job seekers with a conversational bot that assists with searching for a job. A dynamic experience that changes and adapts to every visitor. design and your own assets to make the site as your brand. Allow job seekers to search for jobs and gather more information about your organization and culture in an engaging conversation. Each conversation creates a job seeker profile or updates an existing profile in the Candidate Pipeline. Job seekers can also be prompted to join your talent community. Responses and job recommendations are personalized to the individual based on previous conversations and visits on your career site. 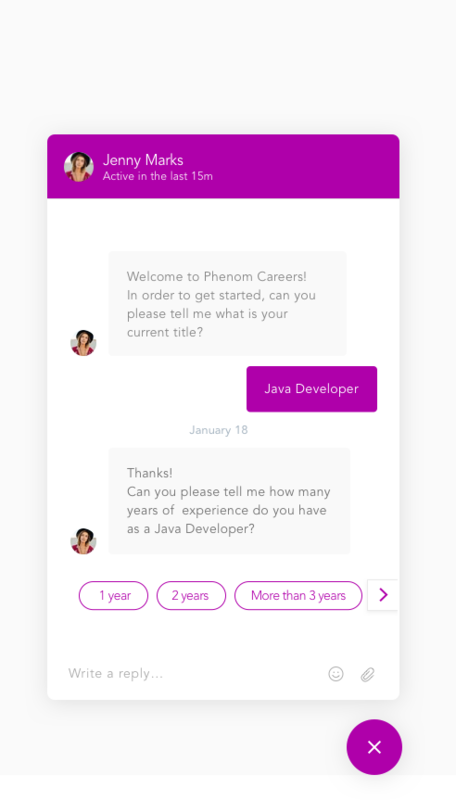 The Phenom Bot guides job seekers through the job search and profile completion process on your career site and social media channels.